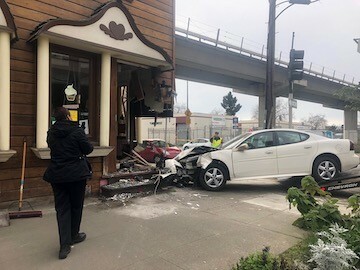 On Sunday February 24 a speeding car crashed into the Angel Cakes building on Fifth Street in Oakland, causing a gas leak and extensive damage to the building. Fortunately, though staff were working at the time, no one was physically injured. I’ve included some photos and a link to a news report below. We are thankful that no one was hurt, although we are completely devastated and in shock. 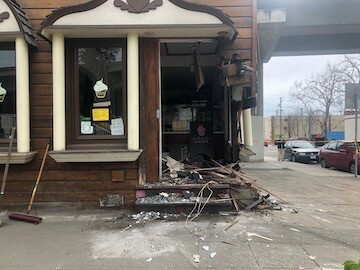 We are working with the building owner, our insurance company, and our community on a plan to reopen our retail shop. 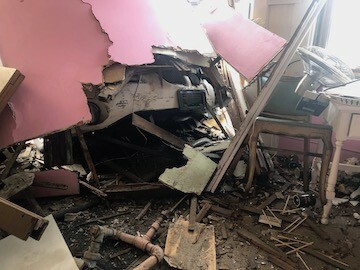 Though insurance will cover much of our anticipated expenses, they won’t cover everything and we will need your support to reopen. We know that this will impact us for a long time. We will will host a special thank-you event for donors when the shop reopens. Coupons will be mailed to you and will be redeemable at our retail shop when we reopen. 7. Like and share this post on Facebook or other social media to help signal boost this message. Thank you to everyone who has reached out so far, your calls, texts, and emails have meant everything. I know we will get through this together.